Dehradun, January 21: If you want to travel from Dehradun to Amritsar the no need to travel via Delhi as you have a direct flight connecting Uttarakhand and Punjab. 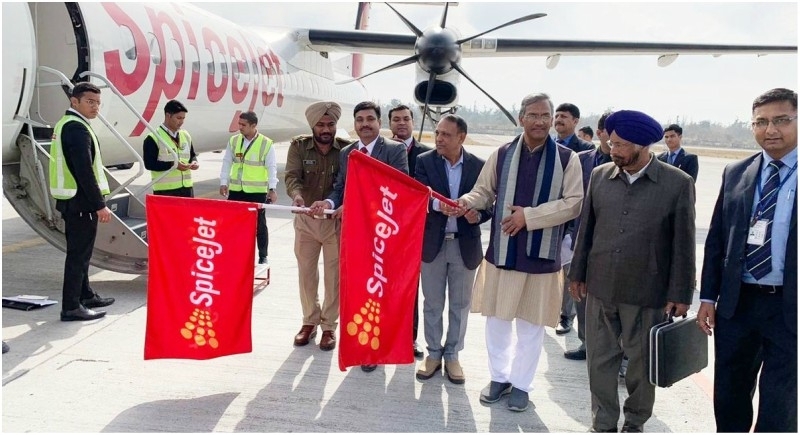 Uttarakhand Chief Minister Trivendra Singh Rawat flagged off the air services from Dehradun to Amritsar from Jolly Grant Airport in Dehradun on Sunday. On this occasion Chief Minister said that work to connect several cities of the country with Dehradun is being done. He said that there was demand for direct flight from Amritsar to Dehradun from long time. Chief Minister said that expansion of air services in the state is being done expeditiously. For which the state is getting complete support from the Central Government. He anticipated that the flight would act as a bridge to cement spiritual and cultural ties between the two states. The flight will leave Dehradun at 11.55 am and will arrive in Amritsar at 12.35 pm. A return flight will leave Amritsar at 12.55 pm and arrive in Dehradun at 1.35 pm. The total duration of flight will be 40 minutes. The aircraft has a capacity of 78 passengers. The flight will connect the holy city to the religious, wildlife, adventure and heritage, tourist circuit of Uttarakhand. It will connect to Haridwar, Rishikesh, Mussoorie, Hemkunt Sahib, Nainital, Ranikhet and other places.